A complete design nerd, I've been admiring Serra's stores via Instagram for years. Telling people in Missouri that I do graphic design for cannabis brands tends to leave many a little lost for words. As I watch the tie-dye and clip-art cannabis leaves roll through their heads, I explain that dispensaries are probably not what they picture in their head, sometimes offering pictures of what modern cannabis shops can look like — with Serra at the top of my example list. As a minimalist whose favorite colors are white and gold, I drooled over the Pinterest-esque images of Serra's brilliant white environment and gold accents filled out with beautifully lush and natural greenery. I'm passionate about creating experiences for people, organizing all the pieces of an experience down to each little detail — and it's impossible to miss the impeccable job Serra has done in creating a consistent brand and design. I finally got to visit Serra on my first trip to Oregon in early November 2017. I had never been to Oregon and was excited to check out the legal cannabis market. Founders Cambria Benson and Chasity Roesler treated me to a tour of their downtown location where I got to hear about how the store came to be and all the little details that set it apart from other dispensaries in the area. Serra redesigned cannabis shopping into an experience that feels completely opposite to that of buying from your black-market dealer. The entry has an unapologetically open and exposed aesthetic with floor to ceiling windows that allow for tons of natural light. The luscious greenery and bright lighting create an exploratory environment while elegant gold accents elevate the overall feeling of quality and attention to detail. 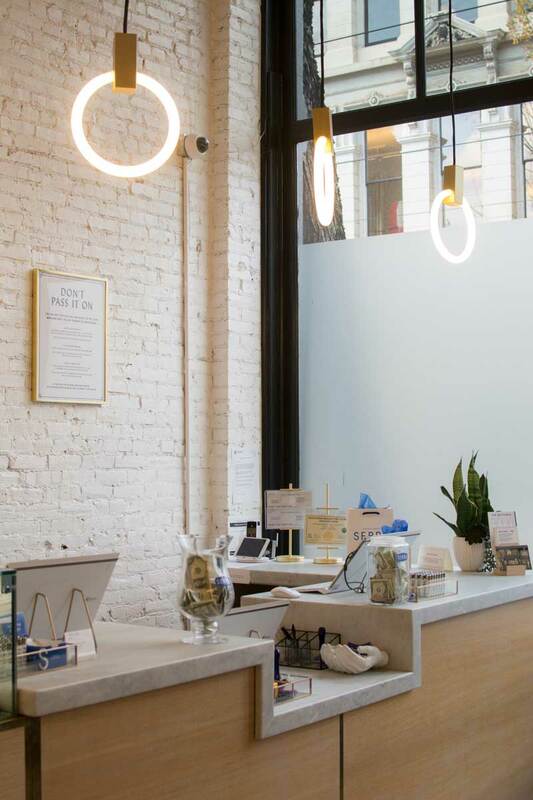 The staff was friendly, informed, and inviting — and Serra's signature phrase, "Quality Drugs," written in flawless script, is a bold statement that simultaneously acknowledges cannabis' history and future. The phrase "Quality Drugs" appears in Serra stores as an "homage to past apothecary aesthetic"
Serra displays each of their strains in separate boxes alongside an informational card that has 7 individual bits of information: the primary and secondary feelings (see below for more info), two sliding scales (mellow - strong, head - body), traditional strain classification (sativa, hybrid, indica), strain name, the farm it came from, the THC and CBD content, and the price (per gram, 1/8, 1/4, 1/2 and 1 oz). Serra has developed six different classifications to describe the feelings their strains evoke: relaxed, focused, creative, happy, energetic, relief. Each feeling has its own symbol, which is the first thing to appear on the informational cards next to each bud. Every strain has both a primary and secondary feeling associated with it for customers to reference. I really appreciated this approach to describing the effects of a strain, rather than relying on generalizations like sativa and indica (although I like that those are also included on the cards for people who are more comfortable with this method of classification). The next bit of information includes two sliding scales divided into increments of 10. The first ranges from mellow to strong and the second from head to body, which are both connected to the THC and CBD content (which is also helpfully listed at the bottom). I really appreciated this approach as well, as it simplifies the process of comparing various strains. Sitting by the display are cards to help customers track needs and ideas while searching for their perfect product. It displays each of the six feelings and their symbols for easy reference and has sections for Selections and Future Recommendations. I thought that these were brilliant, as they facilitate the learning process for new shoppers and gives customers a branded item with personalized notes to leave the store with. Can you say fantastic marketing? Serra has their own line of chocolates in collaboration with Woodblock Chocolate. Shoppers were able to sample each type of chocolate offered in small, non-medicated chips. I spent far too long wandering and snapping photographs, studying the packaging of the brands they carry, and gawking at the beautiful cannabis accessories the store curates. Never before have I experienced such a luxurious and well-designed cannabis experience where each detail was thoughtfully planned, revised, and executed. Walking out was painful; it was an experience that I never wanted to end. There truly is no other dispensary like Serra.